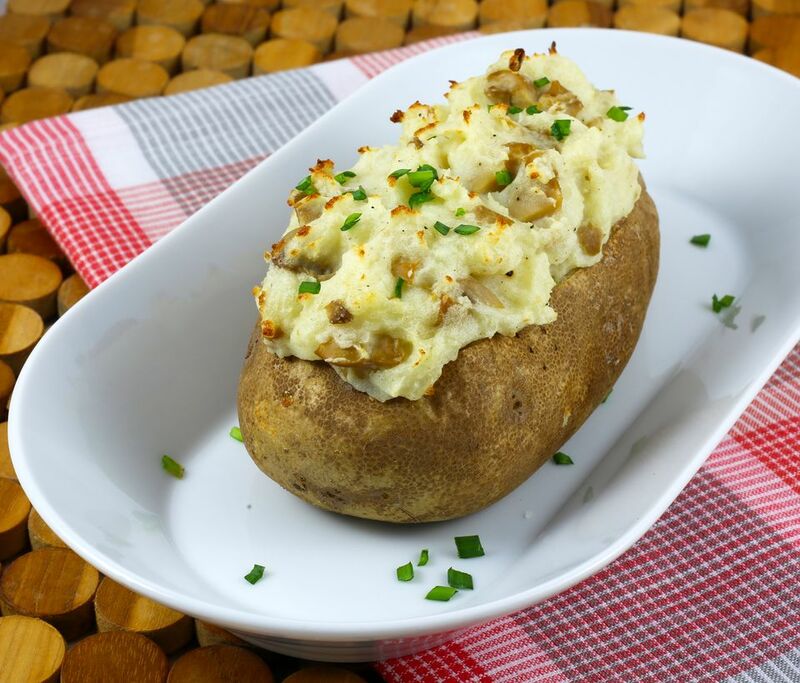 Twice baked potatoes are a tasty alternative to mashed or plain baked potatoes. You can prepare these a day in advance. Feel free to add some bacon, diced ham, cheddar or Parmesan cheese, or sliced cooked mushrooms. Pierce top of potatoes with a fork. Bake for about 50 minutes, or until potatoes ​are tender. Remove a thin slice from the top of each potato and scoop out most of the potato into a bowl, leaving shells intact. In a bowl, combine the potato with the sour cream, 3 tablespoons milk, and the butter; beat until well blended. Add more milk or half-and-half if needed. Beat in salt and pepper then spoon the mixture into the potato skins. Sprinkle with the chives. Cover and refrigerate until the next day or bake at 375 F for about 10 to 15 minutes, or until lightly browned. If the potatoes have been refrigerated, bake at 375 F for 20 to 25 minutes, until hot and lightly browned.